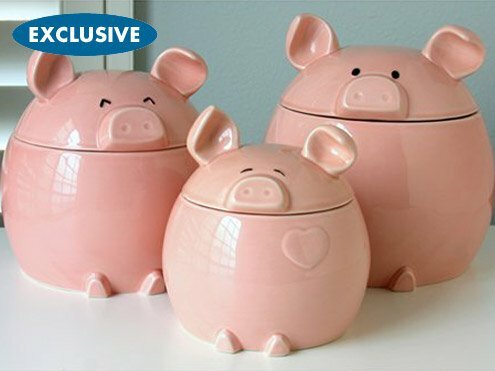 We love the piggy canister set seen on Food Network’s “Down Home with the Neelys” so much, we were inspired to come up with some piggies of our own. 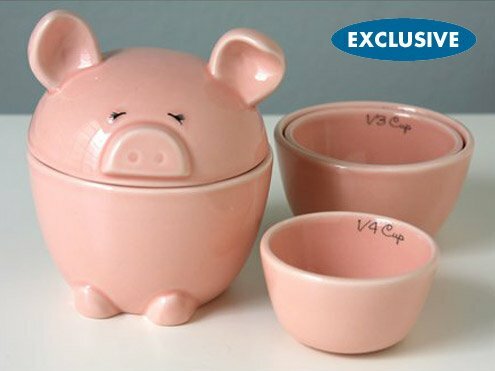 Our charming “Lil’ Piggy” Ceramic Measuring Cup Set (who we have affectionately named Bakin’) includes 1/4-cup, 1/3-cup, and 1/2-cup measure that conveniently nest in Bakin’s body, which is a 1-cup measure. The lid is little Bakin’s cute face, with long-lashed eyes blissfully closed over her sweet stub nose (reveling in the smell of freshly baked cookies, no doubt). Asymmetrical, folding ears add character while providing a functional grip for lifting the lid, and an endearing curly tail adorns Bakin’s back. Hand-finishing gives each of the Lil’ Piggies a vintage, artisanal feel, such as the detailed script that label each measuring cup and the adorable piggy decal in the base of 1/4-cup measure. This exclusive set is perfect for any baking or measuring need and, of course, Bakin’ is happiest when in the company of the rest of her family, the 3-pc. Ceramic Lil’ Piggy Canister Set (a.k.a. Dad, Orson; Mom, Pearl; and big brother, Jr.). Is there any chance that the pig canister set and measuring cups/spoons will be or is available now? My daughter collects them and I would love to purchase for her for Christmas. No idea! You hear that Del Rey?– people want these nesting pigs!